Now completed, our Memorial and Wildlife Garden is open to vets and members of the public. Our pet cremation services were founded 35 years ago, when founder Ray Hale realised that there were no facilities catering for pet loss. He opened Cambridge Pet Crematorium in 1979, which quickly became popular amongst pet owners, with people travelling across the UK to use our services. Our aim is to bring our services closer to Veterinary Practices to give their clients a more personal and local service. We felt that an Official Opening ceremony was the perfect way to present our new facilities to the local community. The Opening commenced with a speech from our General Manager, Jason Cracknell, welcoming our guests. 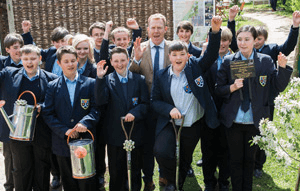 This lead on to Adam Henson and two students from Tewkesbury School partaking in a symbolic tree-planting ceremony, to mark the Official Opening of the Memorial and Wildlife Garden. Thereafter, a moment of remembrance took place as Alistair Hudson, one of our managers, read an excerpt from a bereavement poem. 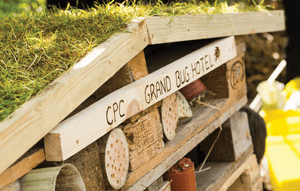 As guests explored the garden, Kate Arbury from Kemerton Wildlife Trust assisted the students with the construction of a bug hotel, to encourage wildlife into this peaceful area. 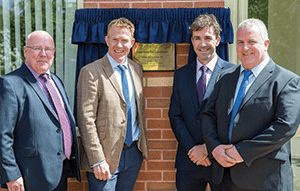 The event was closed with a speech by Adam Henson about his bond with animals and the unveiling of a plaque. Cheltenham Pet Crematorium has been open for a few months, providing pet owners and local vets with compassionate cremation services. As well as the garden, our facilities include a visitors’ area and a farewell room where owners are able to see their pet in private before the cremation takes place. In the farewell room, there is a table where the pet is peacefully laid, after being carefully groomed, so clients can say their final good-byes. Pet owners can choose to bring their pet to the crematorium or have their pet collected from home, while other people ask their vet to make the final arrangements. Students of Year 9 Horticultural Society at Tewkesbury School played an integral part in the creation of our Memorial and Wildlife Garden. In the months before the event, the students visited our site to plan and sketch out ideas. They spent some time with Julie Ritchie from Hoo House Nursery, who advised on key areas of landscaping; such as placement of plants, colour schemes and atmosphere. The design implemented, by landscape gardener Phillip Ball, was a culmination of several plans to incorporate a variety of the imaginative ideas that the students came up with. The students were on hand to discuss the concepts with our guests. Clients and vets from across the South West areas attended the event, bringing along their companion animals, meaning that they too could explore the garden and visitor’s area, learning more about pet bereavement and the services that we offer. 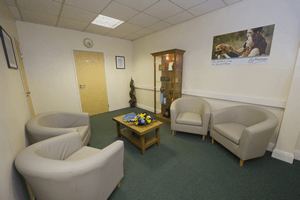 Contact Vet Support on 01684 857492 for a tour of Cheltenham Pet Crematorium, or for more information on our services.